Don't think we had a Town Hall Reno thread, so here will do, but noticed over the weekend that they have installed some additional wayfinding signs near each escalator. Usual metal exterior with orange trim. But these are electronic. We're displaying Testing when I saw them, but presumably will be used with the escalator direction changes that occur at Town Hall as the flows alter. 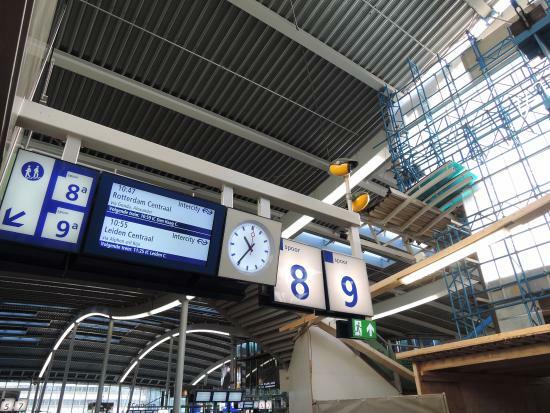 A small electronic screen on the concourse, giving some brief information about the next train departure on the platform. It doesn't appear they are large enough for that level of detail. 8 electronic signs, 8 escalators. 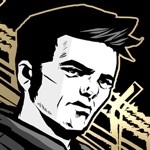 From the current text could be up to four lines of display. But I'd expect it just to show platform numbers and Tx Line identifier, or No Entry. The impending new timetable commmencing from 26/11/2017 also means that the Bus Priority Infrastructure Program will see changes rolled out across the Inner West, mostly affecting Region 6. During June and July a very large percentage of bus stops along routes 412 and 423 had the old yellow j-stems removed and new blue hop blades and j-stems installed. Now some of these shinny and colourful new bus stops will be removed due to the Bus Priority Infrastructure Program, what a waste of time and money. I wonder if it is possible to screen print white ink over the blade that has been removed and then reprint the new information over the blade? Otherwise the blade or j-stem for that matter will have to be thrown out (recycled) due to each blade/j-stem displaying individual location information and route information. TfNSW tasked the RMS with the responsibility for rolling out this particular program, at the same time TfNSW are busy putting up new hop bus stops the RMS will now be busy removing the said new bus stop signage. There is a bus stop on Livingstone Rd (facing North) near Morgan St, Petersham which has a hop bus stop blade with the incorrect information. Two services stop here; 412-In and 428-Out. - 412 City Martin Place. Solution; afix white tape over the affected area to convince customers that the 428 does not stop here at all or if it does stop here, the service has no destination. Stu wrote: The impending new timetable commmencing from 26/11/2017 also means that the Bus Priority Infrastructure Program will see changes rolled out across the Inner West, mostly affecting Region 6. During June and July a very large percentage of bus stops along routes 412 and 423 had the old yellow j-stems removed and new blue hop blades and j-stems installed. Now some of these shinny and colourful new bus stops will be removed due to the Bus Priority Infrastructure Program, what a waste of time and money. I wonder if it is possible to screen print white ink over the blade that has been removed and then reprint the new information over the blade? Otherwise the blade or j-stem for that matter will have to be thrown out (recycled) due to each blade/j-stem displaying individual location information and route information. Many of the stops to be removed along the 412 were not redone in the new style. Initially I wondered why they missed a few but now it seems these are the ones to be removed. Notices have gone up at them. About half the new Town Hall signs were working today. Pic from outside, with my crappy focus in low light. As I predicted, very simple. This was next to two no-entry escalators. Arrow points 45 deg down when next to an entry point. moa999 wrote: About half the new Town Hall signs were working today. I guess the directions of the escalators will be changing according to needs, much more frequently than they currently do? They need something instead of a T for intercity, maybe BMT in a box? Your avatar provides the ultimate solution, but this is today's NSW. The bus stop on Homer St near Braeside Cr is a blue Hop branded bus stop and is scheduled for removal. 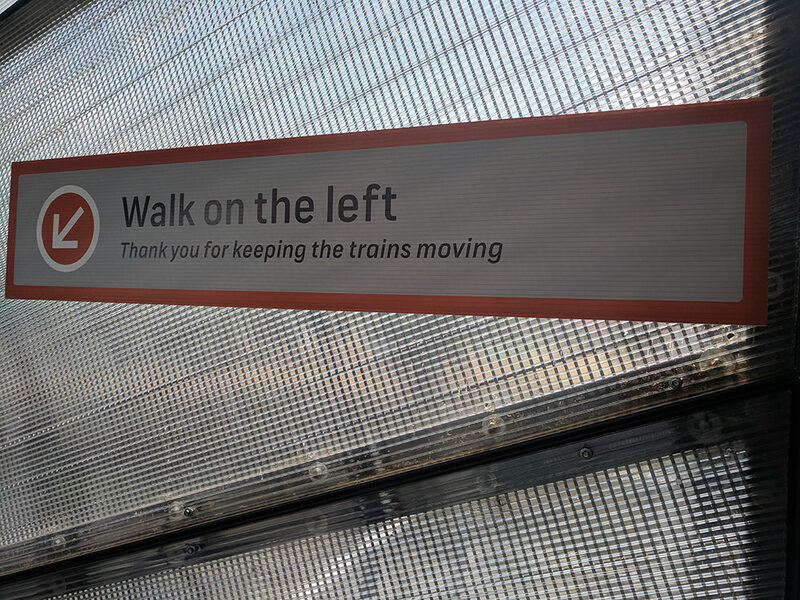 Does anyone have copy of "Getting around with Sydney Trains" brochure with November 2017 version? Looks great, now hopefully they bring these to more (larger) stations on the network. Looks like a cheap version of Hop branding has made its way to Red Bus bus stop signs on the Central Coast. B with a "Please signal driver" decal covering the old version. Town Hall has already been updated. New subtle design/style which I think is quite nice. And then naturally the rest of the existing signs got refreshed. I still don't understand this T nonsense. How would poor visitors to Sydney cope? They would feel lost like they are in another...oh never mind. 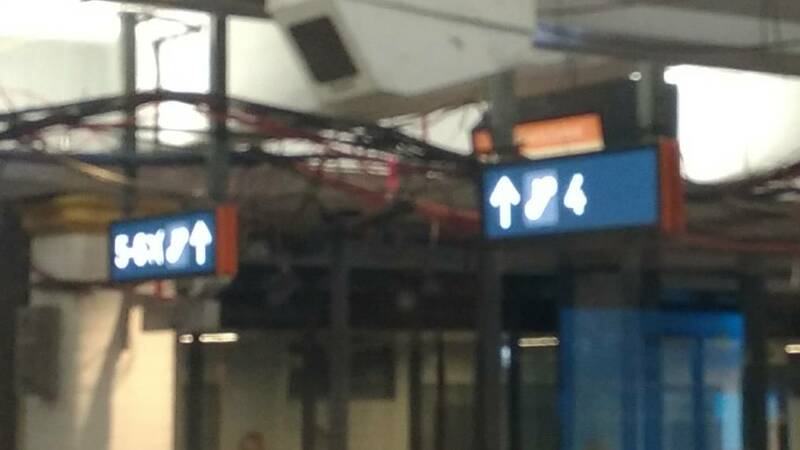 The Town Hall signage says that T3 Liverpool services go from Platform 6, except a lot of them now go from Platform 1 instead, so it is a bit confusing for passengers who might not know this. Liverpool is mentioned on the Platform 1 list as well. moa999 wrote: Liverpool is mentioned on the Platform 1 list as well. Because it's T2 Leppington via Liverpool? Or is it T3 Liverpool via Bankstown? 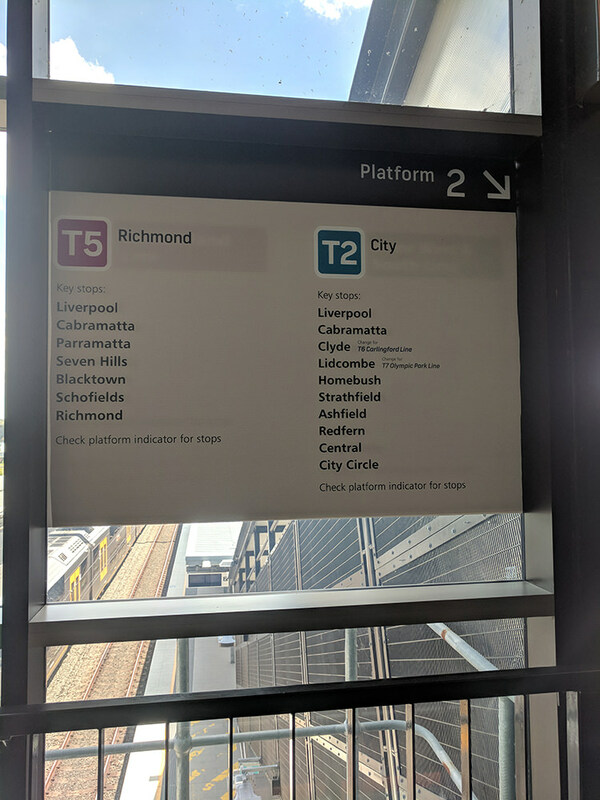 It's T3 Liverpool via Bankstown, hence my post! It is wrong (the sign). jaseee wrote: It's T3 Liverpool via Bankstown, hence my post! It is wrong (the sign). Not exactly wrong, but on weekends that is where Liverpool via Bankstown trains depart. Hard when it's both platforms 1 and 6. 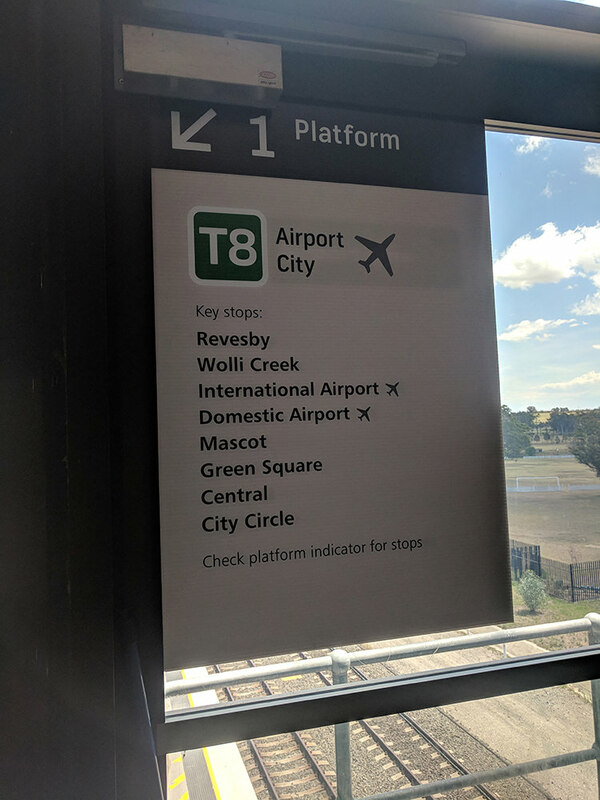 If I'm not wrong, most T3 services from city use City Circle clockwise (even on weekends) except for Liverpool bound on weekdays, so it would use Platform 6 (clockwise City Circle) a lot more often than Platform 1 (anticlockwise City Circle). Some stations that never had (Hop) platform-wayfinding before the new timetable have gotten this recently since the new timetable.